My name is Laurence Robb. I am 53 now. I found out I had Multiple Sclerosis (MS) in 1976 when I was working as a foreign language assistant in a secondary school in Chelmsford, Essex. I suddenly squinted when I was checking reading a number plate at a distance for my application for a driving licence. I am used to MS. It was diagnosed at the end of April 1983. It has been with me from Remitting-Relapsing MS (RRMS), until after arguing enough with my neurologist, we decided to call it Secondary Progressive MS (SPMS). I knew there was always something left behind after a relapse! I think it might have been in 1992. I do not need to see a neurologist. I have regular contact with physiotherapists specialized in neurology. When there are not enough of these specialist community neurology physiotherapists, I campaign to have some appointed. It is fun. My GP’s prescription is campaigning and physiotherapy. The neurologist I saw in 2003 approved. I have carried on with physiotherapy exercises from the time of my 1983 diagnosis. I became an outpatient of a local community physiotherapy service when I moved from London to the South-West. 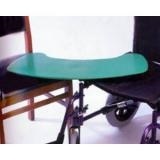 I progressed with SPMS from using one walking stick, two sticks and some crutches in 2000 to using the wheelchair most of the time since July 2007 after a nasty fall. I am going to tell you what happened to me in February 2008. It was very traumatic and certainly not caused by MS. However, I would be running around if I had not had MS. I am just nearly getting back to where I was, before it all started. This is going to show that at anytime, even with Multiple Sclerosis (MS) other parts of the body can go badly wrong. I would like to say that SPMS is not understood fully by the medical and clinical NHS staff. It leaves the persons with MS (PwMS) do their own battle, especially if they have a long experience of management of their MS with physiotherapy, massage and reflexology. In 2008, I had 32 years of MS. I was always active and I had received 25 years of physiotherapy treatment. I had practiced some gym exercise learnt aged 15, practiced my Autogenic Training as long as my spasms allowed me and a Sun Salutation yoga sequence. Even if I was running out of puff, I was trying very hard every day. I feel that my problems need to be explained from the beginning. I was watching Arsenal getting beaten absolutely by Man United, in February 2008. I felt a bit shivering and cold. I had gone a bit numb and could not stand up from the settee to the wheelchair. I had a “normal” week after this incident. I saw my MS Nurse and mentioned what happened. She wondered if it could be a urinary tract infection (UTI). I said nothing seemed wrong and I did not have a bladder catheter. The trouble started on Monday a week later when I had a sudden fever late morning I was shaking and rigoring, which needed a call to my GP. The fever went down with Paracetamol. It never left me really. It showed up each time the tablets were due; not with rigoring until late morning the following day. I never stood and tried walking using crutches, as I felt weak. I did no exercise standing in front of the kitchen worktop. It is good for the legs, hips and it makes me breathe deeply. I was sent to Paulton Memorial Hospital (PMH) by ambulance as my temperature had shot up again. I was frightened! The suspected UTI, that had sent me there, was eventually ruled out. Just anaemia (fibroids) and the beginning of hyponatraemia (caused by two medications for continence and water retention) were diagnosed. Rigoring returned once during the little hours of one morning; a doctor had to drive urgently to my bedside from Bath Royal Infirmary (BRI). The fever calmed down like a ferocious animal receiving a dart. The long awaited scan time finally arrived. A consultant gynaecologist, who by luck was doing a clinic at PMH, had a look at the scan and said that my ovaries had to be removed urgently. They were swollen and one was inflamed. I felt worried about the operation but relieved that something was diagnosed properly at last. Infections can be undiagnosed, as other symptoms, which are also urgent like a suspected cancerous tumour to an ovary revealed by the scan. The removal of my ovaries took precedence. After a second emergency intervention due to some internal abdominal bleeding, pneumonia was discovered with its pleurisy sidekick. In the middle of this, a tourniquet had been forgotten overnight by a busy doctor trying to place a canula, I have had a mark on my arm that will be there, as a tattoo, for a very long time. I had fallen asleep when the doctor was called away because I was pumping morphine. My arm was swollen but I remained calm and positive to help the healing process. I did not lose my arm; I felt I was lucky then! My rehabilitation was concentrated only on my pulmonary condition. I also did not take well to one of the necessary blood transfusions, which even cross-matched, did not suit me at all: I fainted. It is not “Holby City” as I explained to the medical staff. It slowed down the rehabilitation. The ITU staff had to run to my bedside with special oxygen equipment. My room was full of interesting devices. My favourite was the one I called Fred, which was a programmable drip for the antibiotics to treat my pneumonia. It made things complicated when I had to go to have an x-ray. However, I was more horrified to see all these mirrors in the lifts. I needed to have my hair done! My optimism was still strong. I started making plans to modify the house. I repeated often: “when I get out of here”; the list was getting very long. I was sad to miss the whole spring season. I had to stay a total of fifteen weeks in hospital. In the middle of this, Methicillin resistant Staphylococcus aureus (MRSA) was diagnosed on my skin. Considering the long process of clearing this infection, which can only work when strict rules are adhered to; I still think that my rehabilitation has been delayed. I was feeling despondent. I had a young PwMS woman visiting me at the time, she said that I should consult my neurologist to see if there was a medication that would help me. I cried a bit for a while, as I knew that there was nothing of the sort. 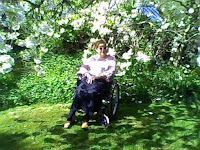 I have not taken any medication to help my MS since 1976.
being able to stand and walk would be unlikely. I was not taken seriously. LuckStaff stood by their professional experience even if it was short. I thought that they did not know me! I had been very, VERY, ill and it is what the medical staff had said. They held on to SPMS at once as a reason for me not to be able to return to what I was able to do before my trauma. It made it easier for them...I was feeling brow beaten. In January this year, I was pleased with what I had achieved even if I had been told that I would have to use a wheelchair for the rest of my life and that nothing could be done. I was also repeatedly advised not to try standing on my own. I had to try this to see if I was getting any stronger. Standing helped keep my spirits up! I had been given a list of exercises, which I modified to fit with the care assistance I received. 2008. In early March 2009, I found that one of the last muscles I had to get working again started holding me vertical (I was not upright in January!) I carried on with my exercises provided by a specialist community neurology physiotherapist. These have been updated to include standing in front of a worktop in the kitchen. At the end of April 2009, I could stand up myself from a chair, shuffle and swivel into another chair! What will happen next? I feel vindicated! it is extremely therapeutic writing it down on the 1st of May, which was so sad for my family last year.